To navigate in Creative Suite 5’s Adobe Bridge, use the Folders panel in the upper-left corner to choose the folder you want to view. 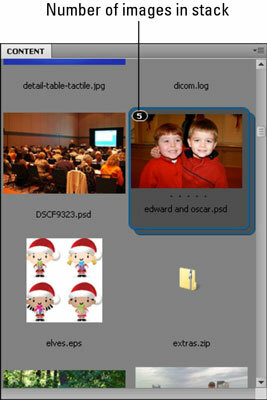 Watch in amazement as previews are created and automatically replace the standard file format icon. Adobe Bridge may take a fair amount of time to build the preview the first time you use it, so be patient. Either choose Tools→Cache→Build and Export Cache to save this data or choose Tools→Cache→Purge Cache to free up file space. Select an individual file by clicking it once (twice opens it) or select multiple files by Ctrl-clicking (Windows) or Cmd-clicking (Mac). Relocate the files to another location by dragging them to a folder in the Folders panel in the upper-left corner. Use Bridge as a central filing system. Using the commands on the File menu, you can create new folders and delete or move files or groups of files. 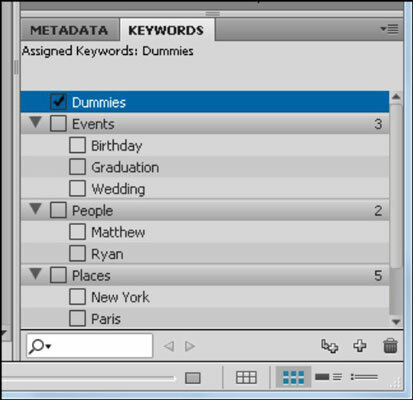 Read metadata in the Metadata panel in the lower-right corner. The metadata includes important information such as Camera, Flash, and F-stop. Enter your own metadata for any item listed by clicking the pencil icon to the right. Use the Keywords panel to enter your own keywords to help you find your images later. Choose Edit→Find or use the Filter panel to locate your files within the Bridge by entering criteria, such as Keywords, Description, Date Created, and more. Create image stacks. You can select many files in Bridge by holding down the Ctrl key (Windows) or Cmd key (Mac) and clicking multiple files. You can then choose Stacks→Group as Stack or use the keyboard shortcut Ctrl+G (Windows) or Cmd+G (Mac). It stacks the images into one compact thumbnail. The number of images in the stack is shown in the upper-left corner of the image stack. To reopen the stack, click the stack number; to close the stack, click the stack number again. If you no longer want the stack, you can choose Stacks→Ungroup from Stack or use the keyboard shortcut Ctrl+Shift+G (Windows) or Cmd+Shift+G (Mac). Check under the Tools menu for application-specific tools, such as Photomerge (merging panoramic images), Live Trace (tracing images as vector images), and PDF Presentation.